Note: Any letters,numbers or symbol are available. 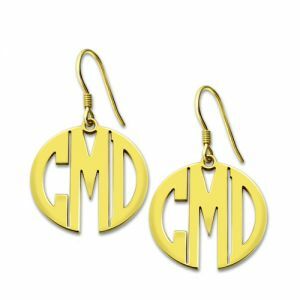 These monogrammed earrings are approximately the size of a dime and perfect for a chic, sophisticated, and personalized look. These make for the perfect gift for someone you know who loves monogrammed jewelry! 1. A monogram is typically structured with the last name as the large initial in the center, the left initial is the first name, and the right initial is the middle name. 2. Read about our Kids Safety policy. 3. Please feel free to Email us with any special requests or questions. For every piece in our collection, the estimated processing time is listed on the product page. Add the processing time to the shipping time for an estimate as to when you will receive your order. Processing time differs from product to product. 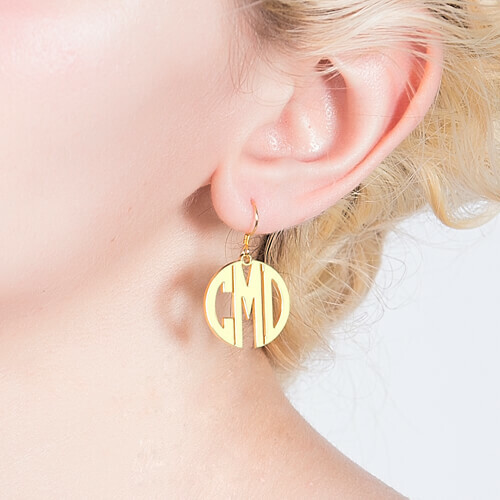 All items are made-to-order and request 3-5 business days to handcraft. Many factors contribute to delivery time. We make every effort to ship your product out as soon as possible within these time frames that are listed on each product page. *Please note that the time frame mentioned above doesn't include production time and account for delays caused by vendors or service and weather disruptions. Should you not be totally satisfied with your items we offer 99 day returns and exchanges service to ensure you are left as happy as possible. Please see here for the full list of terms and conditions for our refund and exchange policy.